Winfried Corduan, Reasonable Faith (Nashville: Broadman-Holman, 1993). No Doubt About It (Nashville: Broadman-Holman, 1997). These are respectively the hardback and paperback versions of the same book. 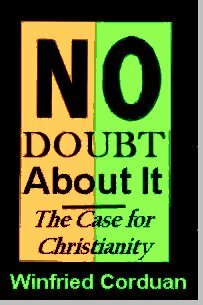 Reasonable Faith, the hardback, is now out of print, but No Doubt About It is the identical book--right down to the typos--at half the price. After teaching apologetics for quite a few years, the opportunity arose for me to write a textbook in the area. Before I wrote that book, I was in a quandary for a text in apologetics that was at a level above totally popular books, but did not seemingly require at least a minor in philosophy. Furthermore, neither William Lane Craig's nor J. P. Moreland's books address the problem of evil (how can you do apologetics without that?). But the main point is that a course in apologetics is required of all students at Taylor University regardless of their major, and so I needed a book that would be accessible to students for whom it would possibly the first (and maybe even last) exposure to philosophy. Each chapter begins with a series of vignettes which provide a practical introduction to the topic of that chapter. After I address the issues of the chapter, I then go back and show how my conclusions would answer the opening vignettes. My approach is theistic and evidentialist. I am grateful to all the various colleagues across the country who have adopted this book as their textbook in apologetics courses.